Most timid cats are incredibly gentle. The rare cat may be so frightened of people that they may try to keep you away from them using aggression – spitting, lunging, swiping, or even biting. You can tell a lot about how a cat is feeling, and protect yourself, by watching their body language. Some signs are very subtle. If your cat does any of these things, celebrate! Cat bites hurt and can become infected. Keep yourself safe by always taking things at your cat’s pace. They will do things in cat time, not people time. If you think they may use aggression – swipe or bite you while cleaning their litter tray or changing their water – it’s ideal to have a carrier, with a soft cushion inside, as their hiding spot, instead of an igloo. Leave the door attached. Use a stick to push the carrier so that the front of it is against the crate wire – they won’t be able to reach you. If you get scratched badly, colloidal silver (from a health food store) may help avoid infection. Aggression can sometimes be related to the situation the cat is in, and less so to them. We have experienced scaredy cats whose fear was at the ‘I’ll hiss’ level with us, but it escalated to the ‘I’ll spit’ level (thankfully no further!) in a different foster home. New situation, new fear. And then, of course, there is the huge difference between cats’ behaviour at a pound or shelter versus a foster home. So often, cats are said to be ‘feral’ or ‘not coping in shelter environment’, when in fact they’re just very frightened. And why wouldn’t they be? Thunderheart came to us as a teenager. He was young, he was friendly (not a scaredy) and he got on with our cats. We thought he’d be adopted quickly. And then, everything changed. I was on the phone, with him sitting nearby. He started looking intently at me. It wasn’t a ‘Watcha doin’? Where’s my dinner?’ look. It was the threatening, unblinking stare that cats display when they’re ‘mentally fighting’ with another cat, issuing a challenge, daring them to keep staring and they’ll show them who’s boss. And then, he launched himself at my head and hung on. The person on the end of the phone got a loud yell piercing their ear. I was shocked. Where had the gentle, friendly, cute cat gone? We thought it might be a one off, a ‘Why aren’t you paying attention to me?’ message, but he continued launching at us – our head, our arms, our legs – and hanging on with his claws. We were covered in scratches, shallow bites and bruises. We wondered if maybe we were the problem, but then our catsitter was subjected to the same treatment. He did it to anyone who came into the house. Some people suggested he should be killed, that he was unadoptable. We couldn’t do that to him. He had been a lovely cat. He could perhaps be a lovely cat again. We had to find a way to help him. 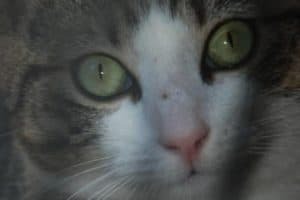 We were extremely fortunate to connect with a person who was very experienced with all sorts of cats and wasn’t phased by a bit of aggression. She came out to assess him, then took him in. To our great relief, he never put a paw wrong when with her. Thunderheart got on well with other cats and welcomed visitors with a friendly ‘tail up’, rather than a smack to the head. He was quickly adopted, with a cat friend he made there, and has been fine ever since. We still don’t know what was triggering him in our home, but we learnt a valuable lesson – sometimes ‘it’s not them, it’s us’, or at least where they’re living. If you have a scaredy cat who’s displaying aggression, you might be tempted to force them further out of their comfort zone and ‘push through’ the aggression. This is likely to backfire – it will probably cause more fear, delay their progress and perhaps lead to you getting injured. You may need to lower your expectations of how quickly your cat will progress. Just take some steps backward and give them more time. Try attaching a Feliway diffuser to their crate and spraying Feliway spray into their crate at least twice a day. Even if a scaredy cat is aggressive, you can still help them learn that you’re the good guy by hand feeding them. eventually, take the plunge and put food on your hand. Watch their body language at all times when doing this. Purring Contentment (unless they’re in pain). This means wonderful progress.